Spencer Pumpelly made heads turn as he turned determined laps when disaster struck during the Motul Petit Le Mans. The No. 73 Park Place Porsche GT3 R slowed to a stop on track. Pumpelly maneuvered the No. 73 Porsche out of harm’s way before coming to a full stop, albeit a little too well. Pumpelly was stranded out on track for nearly 30 minutes as he waited for a yellow flag and a tow back to the paddock. The time between the No. 73 Porsche stopping on track and being delivered back to the paddock caused the team to fall over 30 laps down. While the issue was fixable, the race was determined not to be, and the team decided to retire. 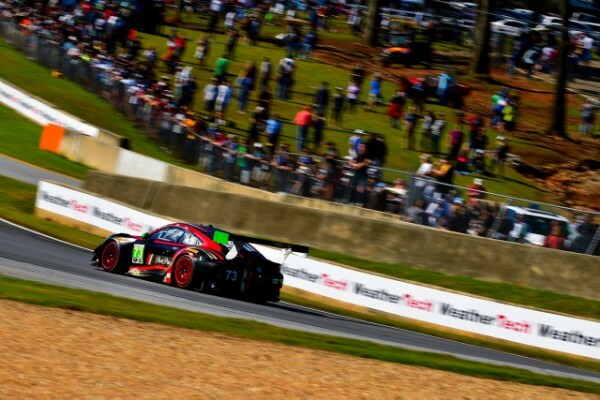 “To start the stint the car was fantastic,” Pumpelly said. “We put a lot of work into it over the course of the stint to make it faster, but I was really surprised when I got in on fresh tires how fast it was for the first few laps. It was a car that seemed to be good over every stage of the race. We started to lose grip as the tires wore but we still were running a lot faster than the people we were chasing. While running, Pumpelly ran a lap time of 1:20.536, the second fastest lap of the race behind points leader Madison Snow in the No. 48 Lamborghini. Before retiring from the race, Pumpelly propelled the No. 73 through the field to the lead lap and 10th place after being put a lap down during the pit stop Pumpelly jumped in to relieve Tim Pappas. Wolf Henzler did not get track time after the recon lap before the race.